Villa 080 is just a stone’s throw away from the crystal clear Mediterranean Sea. 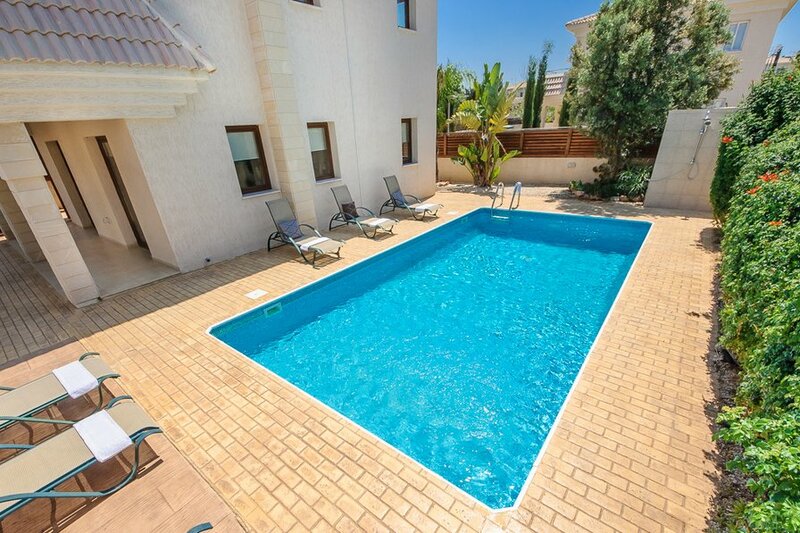 The villa offers you a beautiful holiday home with every possible convenience and comfort. The decor has been designed with the utmost care and taste, with a blend of colorful touches that create a positive mood. To the front of the villa is a wall and fence which cannot hide a stone garden with lush palm trees and plants. At the side is off road parking leading to an olive tree, pergola and side entrance. The pergola provides a shaded oasis, ideal for al fresco dining. The villa is fully air-conditioned and all non-frosted windows and patio doors have blinds throughout. The lovely light coloured tiled kitchen with matching light wood and granite worktops are complemented by the stainless steel fridge freezer, dishwasher, electric oven and hob and a microwave. A window lets in light from the front of property. There is a lovely dark brown wood and cream theme running throughout the dining and lounge areas. The large dining table is wood with a glass top and has 8 chairs with brown suede cushions. A beautiful canvas and modern vases are complementary accessories. In the lounge are two lovely leather sofas with modern cushions, which nestle either side of the wood burning fireplace. It also features a glass topped coffee table and glass occasional table. For entertainment access the villa’s WiFi or watch the wall mounted flat screen TV with satellite channels. Light comes in through the two large windows as lovely canvasses and a paper shaded floor lamp add to the room’s décor. An additional electric fan is provided, for extra respite from the heat, should it be required. The patio doors lead out to a covered patio area. The ground floor also benefits from having a twin ensuite bedroom with fitted wardrobes, bedside table, storage unit and wavy mirror. The ensuite has a w/c, shower, frosted glass window, sink and mirror. The frosted patio doors lead to a private balcony. To the side of the property is the beautiful pool, surrounded by sunbeds and a parasol. A large oval glass rattan table and 8 matching chairs easily fit on the patio next to the gas BBQ. The simple stone planted garden brings lots of lovely colour to the area. Stairs with an iron hand rail pass under a window, whilst a window at the top lets in lots of light. An airing cupboard discretely hides away the washing machine. The first floor has three additional bedrooms, 2 double and a twin together with a family bathroom. The bathroom with lovely cream and brown tiles has a shower over bath, sink, rectangular mirror and shaving socket. A frosted glass window gives amazing sea views. The master double room has a large ensuite, shower over bath, room with a frosted glass window. The sink is integrated into the storage units with a mirror and shaving socket. The bedroom has a metal bed, bedside cabinets with lamps, fitted wardrobes, a shelf and a full-length wavy mirror. Patio doors lead out to a Juliet balcony to the front of the property. The second double room has a metal bed, bedside cabinet and lamp, full-length wavy mirror and a shelf, fitted light wood wardrobes and a patio door leading to a shared balcony. The twin room has fitted wardrobes, bedside table and lamp, a shelf and flat screen TV. The patio door leads to the shared balcony. Another lovely Oceanview villa for that perfect holiday. Do not leave your children unattended at any time. We have no responsibility for any accidents or injuries cause by the misuse of malfunction of the equipment. Kapparis (Greek for capers!) Kapparis is an up-and-coming, peaceful and picturesque locality with easy access to the towns of Paralimni and Dherynia, and the resorts of Protaras, Pernera and Ayia Napa. Kapparis is untouched and unspoiled compared to the overcrowding in some resorts. It is a small village where the community is very friendly and who make time for holiday makers. The atmosphere is very relaxed and laid back, which makes it the ideal place for a chill out and get away from it all holiday.